This first-generation MINI Convertible looks exactly like its retro-inspired hatchback relation, MINI sensibly not straying too far from its winning formula. Eschewing the trend of folding hardtops, like its styling the MINI Convertible remains old-school with a conventional folding canvas roof. You lose some practicality, but then the regular hatch isn't exactly commodious, the benefit being even more fun. Which is why owners rightly love them. Mechanically identical to its hatchback relation, the Convertible was available with much the same selection of engines and transmissions. That means you're offered this open-air MINI with everything from the One's 1.6-litre petrol unit with 90hp to the Cooper S with nearly double that output. The standard One and Cooper models make do with a five-speed manual gearbox, while the Cooper S gains an extra ratio. The diesel engines of the hatchback aren't available in the Convertible, though the 1.6-litre One offers respectable fuel economy. Build quality is good, the MINI Convertible feeling solid despite the removal of a large portion of its structure above your head. You lose a bit of space in the rear for the hood's mechanism, and it's darker in the rear seats than in the hatchback due to the thicker rear 'pillars' of the hood, but if that's an issue you can always drop the roof for the full open-air experience. That hood means the boot is compromised too, being smaller, and no longer a full hatchback. Instead it's accessed by a bottom-hinged door, which makes loading bigger items tricky. 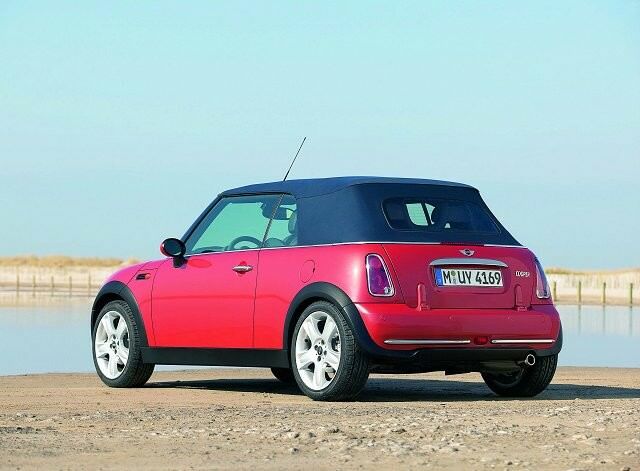 To drive they're all fun though, the MINI a hoot whether you've got the full-on Cooper S or just the One. Saying that, the suspension might be a bit firm for some on the sportier models. The One's a good buy, but there's not that many out there compared to the Cooper, which comes with a better specification too. There's no real penalty for the extra performance either, with the consumption and CO2 emissions figures within fractions of each other. The manual is the choice, too. Not a useful, or a rational purchase, but if you want a fun, open-air car then the MINI is among the best you can buy. It features timeless styling compared to its many folding hard-top rivals, a good drive and fine build quality.